Amazon has acquired Boulder, Colo.-based warehouse robotics startup Canvas Technology, TechCrunch has learned. The deal makes a lot of sense from the outside, adding another important piece to Amazon Robotics' growing portfolio of fulfillment center machines. Amazon confirmed the acquisition with TechCrunch. "We are inspired by Canvas Technology's innovations, and share a common vision for a future where people work alongside robotics to further improve safety and the workplace experience," a spokesperson said in a statement. "We look forward to working with Canvas Technology's fantastic team to keep inventing for customers." Founded in 2015, Canvas has already showcased some impressive technologies, including a fully autonomous cart system that positions the startup as a direct competitor with the likes of Bay Area-based Fetch. The startup raised a $15 million Series A led by Playground Global. The Canvas Autonomous Cart was on display at Playground's open house roughly this time last year, doing an impressive job avoiding people and obstacles in the crowded space. 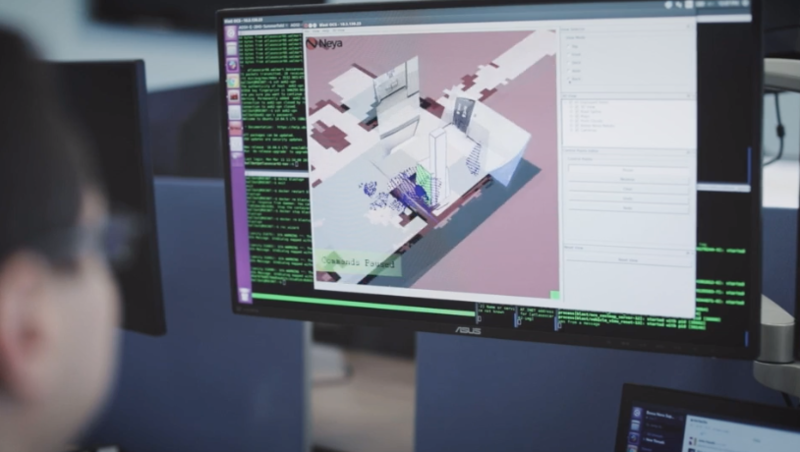 The system utilizes 3D imaging and an in-house software solution that can be applied to other hardware — essentially operating like a self-driving car in a warehouse setting. Canvas should make a nice addition to Amazon Robots' offerings. The division was created after the company's 2012 acquisition of Kiva Systems, whose shelving robotics now serve as a kind of robotic epicenter to Amazon's many fulfillment centers. On our recent tour of the company's JFK8 in Staten Island, the company noted that it currently has some 100,000 systems deployed across 25 fulfillment centers. That number is a combination of Amazon's own systems, along with devices from third parties, including Japanese industrial giant, Fanuc. Clearly, however, the company is looking to put its own stamp on the systems going forward in a push to increase delivery efficiency through automation. Safety has been a big factor, as well. It always is with these sorts of collaborative robotics, of course, but Amazon's fulfillment centers have a built-in extra layer of scrutiny. Earlier this year we got a sneak peek at the company's robotic safety vest, designed to give employees an added layer of protection when entering the fenced-off section of the floor that sports the Kiva systems. Canvas, on the other hand, brings its own built-in safety with its autonomous vision system. The hardware is designed to more directly interact with workers on the floor. It's easier to imagine the company adopting the technology for some of its existing systems, as well. Notably, Canvas co-founder and CTO Nima Keivan will be onstage at our Robotics + AI event next week in Berkeley, where he will no doubt be able to provide some extra insight for his robotics startup panel. Shift, which is based in San Francisco, serves car buyers and sellers. The company, founded in 2013, has built a software platform that lets customers shop for cars, get financing and schedule test drives. Car owners can use the platform to sell their vehicle, as well. Shift says any car it buys must pass a "rigorous" 150+ point inspection. "Given Carvana's trailing revenue of $350 million when they went public as a benchmark, we'd be well-positioned for IPO if we can hit $300 million to $400 million," Russell said. "There's nothing in stone yet, and IPOs depend on a lot of factors like market conditions, but that benchmark is where we'll be positioning ourselves in the next two years." Carvana is often regarded as Shift's closest competitor — although the two companies have distinct differences. Shift's inventory is broader, allowing cars as old as 10 years on the platform and with up to 120,000 miles. Carvana focuses on newer cars between 0 and four years in age. Shift also emphasizes its test drives as a differentiator. Shift's biggest competitor is the traditional used car business, Russell contends. There are 35,000 new and used car dealers in the U.S., most of which are mom-and-pop shops, responsible for about 15 million transactions each year. Then there are private-party sales between individuals, Russell notes. "This super-fragmented environment creates a lot of opportunity for growth for Carvana, Shift, Lithia, CarMax, etcetera, much like Walmart, Target and Amazon all grew over the last two decades," Russell told TechCrunch. Foy comes to Shift from Enjoy Technologies, where he was head of operations. He was previously director of operations for Kindle, Fire, Echo and Amazon Devices working out of Amazon's Lab 126 in Sunnyvale. Shift is counting on Foy's expertise to grow the business and leverage the technology platform, all while maintaining or improving the customer experience. In short, using technology to make it easier for the customer to buy or sell a car without making the process overly cumbersome or intimidating because of the technology. "One of the things that Bezos (Jeff Bezos, Amazon CEO) used to say all the time when we were building Kindle was the technology should disappear, you should not get in the way of the experience of reading a book," Foy said. "And it feels the like the same here; we don't want this to be a technology-heavy process for the buyer, we want to stay as frictionless as possible so that we can attract more and more people onto the the site rather than going to traditional dealerships and giving them a much better experience. So it's really about removing friction from the product." Shift announced in September that it had raised more than $140 million in equity and debt in a Series D round. The round, which consisted of about $70 million in debt and $71 million in equity, was led by automotive retailer Lithia Motors. Bryan DeBoer, CEO and president of Lithia, joined Shift's board of directors. An additional $40 million in equity has since come in, bringing the total raise of the Series D round to $180 million. This new capital brings Shift's total financing of equity and debt to more than $300 million. What started as the dream of a handful of farmers in 2014 spread to a network of thousands of America's farmers managing over 8 million acres–and sharing unbiased information–in just two years. "You have these small farm businesses all over the country that are basically disconnected and they face these behemoths in the industry that have vastly more information. It's one of the challenges farmers face." How much money could farmers save on their inputs if they could share boatloads of information among themselves and take advantage of all that shared knowledge to inform their decisions? A new startup, called the Farmers Business Network, was created on that idea—farmers getting transparent pricing and better information when it comes to making their decisions on seed selection, chemical purchases and other inputs. Originally, a small group of farmers put together the idea for this network and two entrepreneurs brought it to life. In the few years the FBN has been in existence, it has nearly 8,000 farmers participating as members. Those farmers work 30 million acres of cropland in the United States and Canada and are in almost every state—from Florida to Alaska, but are most heavily represented in the Corn Belt. The network has members in nearly every state, including Wisconsin. It also has 350 employees from Mississippi to Washington and into Canada with three of them covering territories in Wisconsin. Charles Baron, a former Google program manager co-founded the network in 2014 with Amol Deshpande, a venture capitalist who had started other seed and agriculture businesses and is CEO of the FBN. Their business really launched a year later after they refined a platform to handle the increasing amounts of information from farms. The use of that data allows farmer-members to make better decisions using the network's unbiased information. Only a few years ago, this kind of network wouldn't have been possible—the technology just wasn't there. Now, with more and more data from farms readily available, FBN's computing power helps farmers make decisions. Their aim is to build the largest farmer-to-farmer agronomic and business network in the country, based on anonymous data-sharing from farmers. Farmers putting their data into the network's database are guaranteed anonymity. In a telephone interview, co-founder Baron told Wisconsin State Farmer that the network operates as an independent source of information for farmers and it is powered by the data they provide. "The Farmers Business Network then creates services and technology to leverage the power of that network," he said. Farmers pay $700 a year to be part of the network and can participate at any level they feel comfortable with. They can buy seed, chemicals and fertilizer through the network without sharing data if that's their comfort level. Some farmers in the network, he explained, may have high-tech equipment with yield monitors and the data that comes with that. But other farmers have smaller acreage making it difficult to justify spending the money on the newer technology. "We have farms in the network up to 20,000 acres and we have 80- to 100-acre farms," Baron said. "We allow farmers to participate at whatever level of sharing and technology they have and feel comfortable with." The FBN analytics work with dozens of crops and integrate with over 60 types of precision software. Farmers who join the network can take advantage of financing and marketing programs as well as buying fertilizer and seed. The network has even launched a program to sell health insurance to farmers. Dairy farmer Walker Rynes consulted with Farmers Business Network field representative Dawn Burroughs and the data analytics of the network to make seed purchasing decisions. He figures he saved his family's farm $70,000 on seed this year buying generic conventional corn. That's on top of savings they achieved on farm chemicals and fertilizer. "We created a plan with a partner last year for health insurance since that is one of the most out-of-control expenses for a farmer; and a huge number of farmers go uninsured," he said. "With our plan, farmers tell me they have realized savings of up to 45 percent on their health insurance." The idea that sprouted into the Farmers Business Network was formed when a handful of farmers got together to toss around ideas about how they could compare their farm maps and seed performance. It became a kind of New Age way for farmers to compare notes at the coffee shop, but enabled the inclusion of farmers who were in different regions. They liked how they could see the way certain seed varieties performed on different farms and what optimal plant populations should be. "When farmers start sharing information, they can cut through the marketing that comes from the industry," Baron said. Once they had the data at their fingertips, many network farmers realized they were paying two or three times as much for their inputs as they should have been, he adds. The original cluster of farmers was in northern Illinois and it quickly spread to Nebraska, North Dakota and Iowa. When word of the idea spread, those clusters of farmers expanded to include their friends and neighbors. Baron said many farmers join FBN with their friends to create local agronomic data clusters. Growing up in California, Baron was not a farm boy, but says he became fascinated with the challenges for family farmers as he learned what his Nebraska-based brother-in-law deals with on his farm. "You have these small farm businesses all over the country that are basically disconnected and they face these behemoths in the industry that have vastly more information. It's one of the challenges farmers face," he told us. Since launching the network Baron said they have added e-commerce in the form of FBN Direct so farmers can order fertilizer, chemicals and now seed—even some types of machinery. "We're a low-margin e-commerce business so we are able to go direct to farmers," he told us. They began with sales of farm chemicals in 2016, which allowed their members to achieve savings of anywhere from 20 to 40 or even 50 percent. "Farmers liked that," he says, "but getting into seed turned out to be much harder." Since seed companies didn't want to supply FBN, he said, they started their own seed company called F2F Genetics (for farmer-to-farmer). They work with plant breeders and ship the seed straight to farmers. The information in their database shows that yield differences across the country for genetically modified seed—corn with built-in traits to resist pests—has only a modest yield difference compared to "conventional" corn—varieties with no genetically modified traits. Baron notes that "the economies of using those traits have gone backward." Some farmers using the FBN analytics have reconsidered the value of using those traits. In recent years the vast majority of farmers have chosen not to plant the "non-traited" or conventional varieties. This year, many FBN members are doing it to reduce their costs. Baron said the FBN's seed offerings include conventional non-GMO corn as well as corn with the traits and soybean varieties with herbicide-resistance that has gone off-patent. That has the added advantage that farmers can save soybean seed from year to year, if they choose to. Once seeds became intellectual property, he adds, smaller seed companies couldn't develop traits and had to pay licensing fees to the technology developers. Now that some of those traits have run out of patent protection, the seed can be grown by others, like F2F Genetics. They liken their generic seed to going to the drug store and buying store-brand ibuprofen rather than Advil. There is always a large savings attached to that purchase of a generic. Baron noted that one major factor driving the interest in the network has been the declining farm income experienced by farmers over the last five or six years along with the enormous consolidation in the industry that supplies agricultural inputs – especially seed and farm chemicals. "While farmers' income has dropped, their costs of doing business have not abated," Baron said. In Wisconsin, farms with dairy operations are financially strapped even more and are looking for ways to save money, he adds. Using the data-sharing through the network, farmers have found they can achieve big savings on things like seed and farm chemicals. For one thing, the information shared by member-farmers has shone a light on the fact that identical seed genetics may be marketed under a number of different seed labels. One of the network's projects asks farmers to take photos of their seed tags showing the multi-digit number that denotes the genetic variety. It is information that seed companies are required to include on their labels. Dawn Burroughs, left, and Jason Hawkinson are account executives with the Farmers Business Network, a startup company offering farmers the chance to look at unbiased data provided by members, analyzed through sophisticated computing and customized to their acreage to help them make their best decisions. Burroughs and Hawkinson both work with farmers in Wisconsin on behalf of the FBN. So far, farmers have sent in images of 20,000 seed tags to be analyzed. Baron calls it the seed re-labeling study. "Farmers told us to study this," he adds. Network farmers are contributing their seed bag tags, seed price invoices and yield data to the FBN Analytics project. "We have found there can be $100-per-bag differences in the same region of the country for the exact same seed genetics, marketed under different names. Our farmers have realized savings of $25 to $40 per acre planted. That's a huge amount of money, especially in this farm economy," Baron added. "We have found there can be $100-per-bag differences in the same region of the country for the exact same seed genetics, marketed under different names. Our farmers have realized savings of $25 to $40 per acre planted. That's a huge amount of money, especially in this farm economy." They realize farmers might get a level of service or convenience from one brand that they feel warrants a higher price—like a replant guarantee for example—but the network is built on giving farmers their full options so they can make the best agronomic and financial decisions when buying inputs like seed. Farmers who send in images of their seed bag tags get immediate feedback telling them if there are any matches in the seed re-labeling database for the varieties they sent in. This database created by the Farmers Business Network has revealed that seed companies routinely label the same seeds under multiple brands with dramatically different prices, Baron says. Through the farmer data, they have discovered that some seed corn varieties may be marketed under 15 different labels. "Farmers have been in the dark on this. We found some of our members were planting genetically identical seed in their fields and thinking it was something different," he said. That's because it was labeled and marketed as something else. The FBN's "seed finder" data gives farmer-members access to the largest seed performance database in agriculture, "powered by millions of acres of real yields—all farmer-driven, totally independent and unbiased." The goal of FBN is to take all of the farm acreage information that's been input into the database and turn it into "one big test plot," by aggregating and analyzing millions of acres of farm data through its analytics tools—all while allowing farmers who input data to remain anonymous. Information about a given farm is never visible to other FBN members and that data is never sold. By participating, farmers get comprehensive field-level analytics, reports and mapping on their own farm, and can also access this aggregated data on seed performance and input prices as well as crop and market trends. Agronomists and trusted advisors can also use FBN analytics to manage their client's farm data and produce customized analytics. "By tapping into thousands of fields and millions of acres of data, farmers can realize the power of scale of information that has never before been available to farmers—all created by and for other farmers," state's the company website. "That's what we call Democratizing Data. Farmers, not the industry, deserve the benefit of aggregated information." Earlier this week, Walmart announced a wide-scale expansion of in-store technology. The news came, of course, as the superstore chain is fighting Amazon's encroachment with everything it has. The list includes several robotics technologies — a category in which Amazon has been invested for several years, beginning with the acquisition of Kiva systems in 2012. Pittsburgh startup Bossa Nova Robotics has been a big player in Walmart's ambitions for a while now, as well. 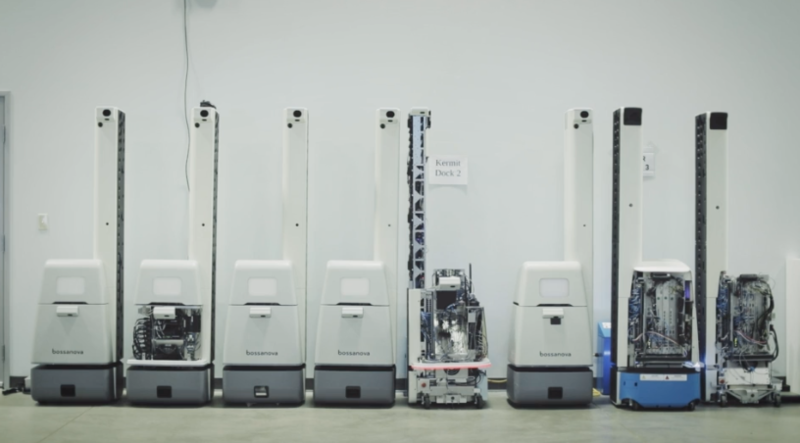 Back in 2017, the retail giant announced that it would be rolling out Bossa Nova's shelf-scanning robots in 50 of its stores. We paid a visit to the company on a recent trip to the Steel City. The company's out-of-the-way headquarters are housed in a massive warehouse. Past the nondescript front offices, where employees work at computers, is a cavernous area that's home to a workshop for iterating its robots, coupled with large aisles of shelves designed to mimic the stores where the technologies will eventually be deployed. The shelves are stocked with groceries that will look immediately familiar to anyone who's spent time in an American supermarket. There are clothing items on hangers, as well, along with a series of technology toys that offer a small peek into Bossa Nova's not-so-distant history. There's Penbo, the interactive robotic penguin, who's perpetually pregnant with an egg. And, of course, Prime 8, the programmable gorilla that runs on his two prominent forearms. The products made it to market with limited success, mostly failing to predict the fickle whims of tech-crazy kids. While the company was created in 2005 when its founders were PhD students at nearby Carnegie Mellon, it wasn't until it opted for something more mundane that it really truly found its way. Capitalizing on the "dull" aspect of automation's "Three Ds," the company developed a system capable of taking inventory of store shelves. "If you think about it, what's the last innovation that's happened in a store?," CTO and co-founder Sarjoun Skaff asks rhetorically. "I can think of self-checkouts and barcodes, really. And retailers have always been very good at tracking a product through the supply chain — from the manufacturer, on the boat, through customs and the distribution center. When it hits the stores, it's a black box. It's anyone's guess whether it's on the shelf, it's in a back room, whether there's some theft or a misplaced product." Bossa Nova's system is capable of tracking boxes and making sure things are where they should be. It's a surprisingly complex task, especially in stores as large as the ones run by Walmart. It's also incredibly dull and repetitive — as someone who's worked in retail, I can attest to this. "Our robot doesn't have arms right now, so it's not replacing the manual labor of restocking a shelf," he says. "It's displacing the tedious task of looking for problems, which is really mind-numbing. And in large stores, it's really hard for a human to compete. Associates have had to do it, because there was no alternative. As soon as we can tell you where the problems are, you can spend your time fixing them, restocking the shelves and spending more time with shoppers." Walmart's certainly been invested in the company. The retailer was Bossa Nova's first major partner, after piloting the technology in some smaller stores. Even with a relatively small number like 50 locations, the deal was an acceleration from 0-60 for a startup of Bossa Nova's size, as it worked to create custom versions of its autonomous scanners. A full list of partner stores hasn't been released, but if you're lucky, you can catch one of its robots cruising up and down the aisles of a local supermarket, three times a day. As for whether Walmart might eventually absorb Bossa Nova, as Amazon did with Kiva, Skaff is cautious. "What we would like to do is serve the entire industry, because fundamentally, the problem we're solving is universal," he explains. "The entire world has the problem, and nobody has a solution. For large stores, the best solution is a combination of robotics and AI." You are subscribed to email updates from &quot;startup company&quot; - Google News.